Entenmann's is a household favorite when it comes to sweet treats. I know they definitely have our vote for baked goodies, and it's not often we don't have something or other of theirs sitting in our kitchen. 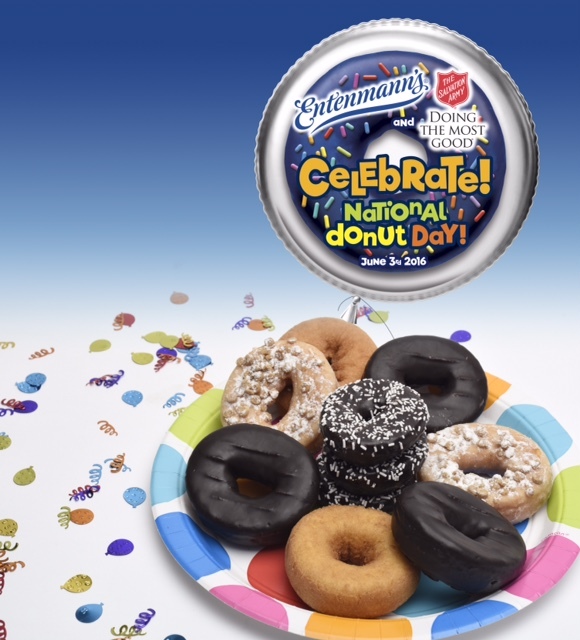 Entenmann's is also often a part of some most excellent initiatives, and this time...because it's National Donut Day, they are up to something extra sweet! 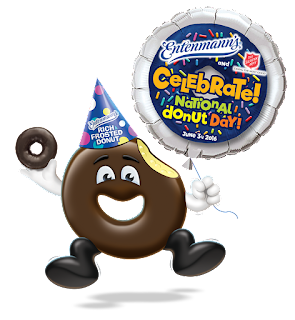 For the sixth consecutive year, Entenmann's and The Salvation Army are partnering to celebrate National Donut Day and the rich heritage behind it! To celebrate in 2016, Entenmann's is rolling out their NEW Entenmann's Rich Frosted Party Sprinkled Donut, an iconic treat made just for National Donut Day, 2016! As a part of the National Donut Day festivities, Entenmann's is hosting a "Win Free Donuts for a Year" Facebook Sweepstakes, awarding 10 Grand Prize winners one year of free Entenmann's Donuts. In addition, 100 of those who enter will be selected to win National Donut Day Party Prize Packs, which include everything they will need to throw their own National Donut Day party at home! For every consumer (fan or not) that enters the Facebook Sweeps, $1 will be donated to the Salvation Army up to $35,000! To help get the party started, Entenmann's is hosting a giveaway here too!! One lucky winner will get: (5) $7 Entenmann's Coupons, one $25 AMEX gift card, Entenmann's Party Plates & Napkins, one National Donut Day T-Shirt and one Rich Frosted Donut Plush Toy with a Party Hat! Enter here and then don't forget to head on over to Entenmann's Facebook Page to enter their awesome giveaway too! Whenever I hear Entemanns, I always think of Elaine from Seinfeld... she held such a grudge for donuts! Hahah! I think of Seinfeld too! Great initiative. Love that the Sallies will benefit. I'm in. Love all things Entenmann's. What a worthy cause too. I love donuts, and Entemann's are great. Love that they are supporting the Salvation Army. I was there! I saw the six foot tall donut! And I ate a few free ones! I love how Entenmann's supports this cause! I love that Entenmann's is helping the Salvation Army. They're two of my favorite organizations. It's nice to see an organization using donut day to help out other. Thanks for sharing these great details. Love any reason to eat some donuts, this brand makes delicious snacks for sure! Thanks for sharing, this is awesome! Yes to all the donuts please! It is hard to decide which Entenmann's variety is my favorite. Really?! National Donut day! I need to run out and get a donut to celebrate! YUM! Yes, I entered the facebook sweeps, we love Entenmann's here in NY! Love Entenmann's donuts and yes I entered the other contest. Thanks so much. Doughnuts and Donations? What an amazing combination! I'll be sure to enter today! Yum! I may have to celebrate. We're definitely big fans of Entenmann's treats. How can you say no to free donuts for a year! That's super awesome. This is what I love about National Donut Day! There's always a sweet treat. Nice to see Salvation Army and Entenmann's come together on National Donut Day. I have entered the Entenmann's Facebook contest. I love the Entenmann's donuts and mini-bites. I've been entering their contest. I enjoy Entemanns donuts from time to time. They are very good. I missed the national donut day. I might have to make up for it. YUM! I love a good donut! Not often, but I do enjoy them :-) I entered the Facebook contest too! Thank you!!! Chocolate doughnuts! Yum! Thanks for the chance. I think it is wonderful that they are helping others. I love Entenmann's donuts. I never knew that have a National donut day. I love eating donuts. I entered the Entenmann's facebook contest, too. I love Entenmann's products. I love their powdered donuts and their little bites banana muffins. I love their rich frosted donuts; thanks for the chance and I did enter on the contest FB page. We love Entenmann's donuts. When I buy them, they rarely last more than a day or two. Wow, I would love to join this. I love Doughnuts and I love their advocacy. I love Entenmann's donuts. I like that little cute plush donut! Thanks for sharing this. Wow, what a great way to donate. I will join this. Thanks for sharing. I entered the Contest for free donuts for a year! What a great prize and so is this giveaway. I love the Cinnamon Glazed Donuts and the Salvation Army is a great organization that helps a lot of people! Nice promotion - the Salvation Army has always done so much good. I LOVE Donuts. I think I could live on them. Yes, I entered the Facebook Sweeps. Donuts are always a treat. I entered the FB contest too. Entenmann's has been around for a LONG time! I think it is good they are giving back to the needy. I already have entered. I want some donuts. I entered the Facebook promotion too, I want to host a big doughnut party! I already entered the Entenmann's contest on facebook! they make some good donuts! Love Entenmann's donuts! YUM! Its great that they support the Salvation Army. We love Entenmanns. We especially love the cheese Danish. I did enter the contest on their facebook page already. I really don't need to eat donuts, being a Diabetic, but I'm sure I'll be able to find plenty of help. Thanks for the giveaway! I will be heading to Facebook to enter! I love donuts! Yes, I will be entering the FB contest. I entered the contest. I always enjoy Entenmann's donuts. My favorite donut is a toss between a chocolate frosted donut and powdered sugar donut. I have entered the Facebook contest. YUMMY!! I would love to win this prize. The chocolate donuts with sprinkles look SO good! Off to enter the FB contest! I love donuts and Entemanns! Love the cinnamon sugar and I will enter the contest! I love Entenmann's products. They are high quality. I plan to enter the Entenmann's contest. We love Entenmann's donuts! I've been entering the Entenmann's Facebook contest. My family loves it when we get to have Entenmann's products. My personal favorite is the frosted chocolate cake donuts. I have not entered the Entenmann's Facebook contest. I love Entenmann’s! Thanks for the giveaway. I entered the fb giveaway also. What a great giveaway. I love cinnamon sugar myself. Our local Salvation Army has some great volunteers and they do a lot for the community and I love donuts. Two great things coming together. My family likes the brownie bites. I entered the Facebook contest. Oh wow what an awesome promotion! My whole family loves Entenmann's products! Entennman's has been my family's favorite for many years. I will be entering the Facebook contest. Thanks for the giveaway! Whenever I'm going to my sister's house, I always pick up a box of the Entemann's Chocolate Enrobed Donuts! Why would I not enter the Facebook contest? We need stock in this brand, but honestly I don't know if we have ever tried the donuts!!! We love the little bites so much!!!! Headed to enter on fb!!! This is such a great cause. We have Entenman's donuts in our cabinet right now. My favorite Entenmann's donut is the chocolate one! Yum! What a fun giveaway and great cause with the Salvation Army! National Donut Day is always such a fun one! I absolutely love Entenmann's! I cannot get enough of their treats and I have such fond memories of me and my dad sharing their chocolate glazed donuts when I was a kid. Wait, we have another donut day? Wow, another reason to explore more for my cravings! You really can't go wrong with Entenmann's though. I entered the Entenmann's Facebook contest too. We have been eating Entenmann's products for years. Enjoyed by entire family. We love donuts! Entenmann's are always the kind I buy when I am at the grocery store. I am only entering your contest. I love their doughnuts. I bet other snacks that they have are good to. We enjoy Entenmann products all the time. I will be entering the Entenmann's Facebook contest too. We have so many special days these days & no surprise we have a national day for those delicious Donuts as well. I am already a crazy lover for Donuts & I love that Entenmann's is doing a great job in donating to the Salvation Army. I really like Entenmann's powered donuts. I love Entenmann's Glazed Cinnamon Donuts. My dad would love this since he gets Entemann's donuts fairly often from the grocery store! Never tried Entemann's donuts but they sound amazing! Their glazed buttermilk donuts are way too tempting! I love the popem donut holes~So good! I love Entenmanns donuts,especially the powdered and powdered cinnamon ones. I entered the facebook sweepstakes. My dad was a huge donut lover and passed that on to me. We stopped at every bakery/donut shop along the road when we went on vacation. I love to much on a powdered sugar donut. Just the perfect taste! Yes I have been entering it! We love Entenmann's products! We usually always buy some of their products every week! We love the large selection that they offer! I love Entenmann cookies! I will be entering on facebook. Yes I will be entering the Entenmann's contest on Facebook. They have some of the most delicious baked goods a grocery store offers. I like the powdered sugar donuts. I entered their FB contest. I entered their giveaway! And we love Entenmanns...especially their classic Rich Frosted donuts! My boys love the chocolate donuts. I love everything Entenmann's makes. It is all so delicious! Donuts are always gone in a flash when I do bring them home--the grandchildren are a little like a ravening horde! I did and thank you for the chance. We love Entenmann's products. The double chocolate donuts are a huge hit. "Rich Frosted Party Sprinkled Donut"? WHOA. Party sprinkles sound so much more festive than regular old sprinkles! And "dough"nations? That's party-sprinkled awesome to me. Love it. We love Entenmann's. I usually buy the Variety Pack of donuts. I love entenmanns donuts and other treats. I am crazy about Entemnann's goodies! Yes I am heading over to enter the FB contest. I've never had this brand before, but would love to try them. Yes, I'll enter the FB contest too. I enjoy the chocolate dipped! I wish I could try the Lemon Crumb as well, but I have never seen them in stores around here. I entered the Facebook sweep as well. I love the crumb cake donuts.. and yes I've been entering the sweepstakes every single day. Those look really good! Now I am hungry for donuts. I am entering the contest on FB. We always have Entenmanns in the house. My family loves Entenmann's products. Those doughnuts are addictive!! Love them!! I love the Entenmann's with the brown little square thingies on them. Not sure what they're called. I don't like to enter FB giveaways, so I won't be entering there. i really love sweets. i want to try the little bites and the donuts. Entemann's is always a sure winner to bring to someone's home. Everyone loves them! I can eat donuts of all kinds. Chocolate frosted, chocolate cake, apple donuts. . . all of them! Entenmann's products are always fresh and very tasty. I'm a sweets lover. I stop at the outlet on fridays after work to pick up a few treats for the family. I love Entenmann's. Our whole family loves their snacks, especially the chocolate donuts. I did not enter the Facebook contest. We prefer to donate to the Salvation Army over other well known national charities. Because they truly are charitable, very little of the donation goes to elaborate suites and executives' salaries. Donuts for a year? Yum! Just don't tell them at Weight Watchers that I entered this! I love their chocolate frosted doughnuts. I would like to enter the fb contest. I love Entenmann's donuts, especially the white powdered ones. Our kids love Entenmann's Crumb Topped Donuts, a treat @ Sunday Brunch ! I love a brand you can count on and I know when i buy Entenmann's for my family, we are getting quality and freshness and deliciousness.